VLC is my favorite program to watch any video. It has so many features and plays every format. One of my favorites is the ability to change the playback speed of the video. It will play the video at a faster rate without changing the pitch of the sound. It is very helpful if you are watching something like a Lord of The Rings, which are 3 hours long each. 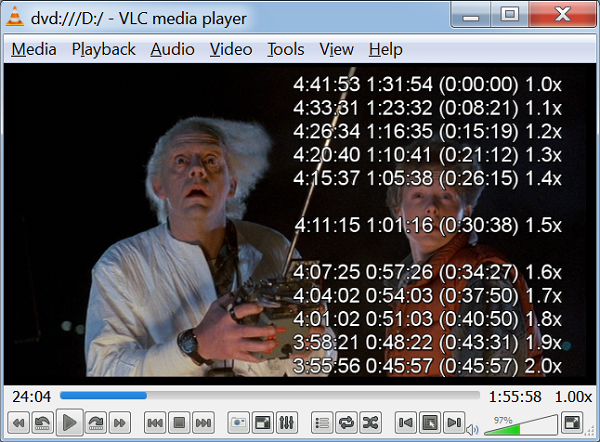 I find that playing at 1.5x is very easy to follow, and will cut down a 3 hour movie to 2 hours. A problem I face when watching a movie at a faster pace is that the time left does not correspond to how long it will take to finish the movie. I found a useful VLC extension called When Will This Be Over? I modified it to display what time the movie will be over, how many hours, minutes, and seconds are left, and how much time you will save. The documentation for VLC extensions is not very good. I tried to find out the playback speed, but it wasn't accesable. I also tried to figure out the playback speed by reading the elapsed time, waiting a few seconds, and then reading the elapsed time again. However, this would not get the right playback speed corect all the time. I ended up settling for showing the times for all playback speed from 1.0x to 2.0x. This turned out to be a very inelegant solution. The script is saved in C:\Program Files\VideoLAN\VLC\lua\extensions on Windows machines. You might need Adminstrator privledges. You might have to create the directory extensions. To run the script, click View -> Finish Time from the menu or from a right click. The only problem is, it is not available in full screen. Copyright (c) 2017 Rawdust.com. All rights reserved. Design by Free CSS Templates.